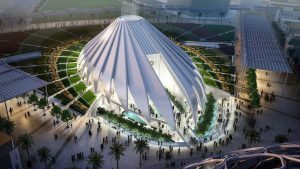 As UAE gears up for Dubai Expo 2020, its remarkably designed pavilions have taken the social media by storm. And as you can’t wait for the breath taking event, here is a glance of the top 6 pavilions that showcase the world’s best innovation and technology. Calatrava’s design is meant to evoke the wings of a falcon in flight. It links itself to the country’s history of falconry and emphasizes the country’s present day goals of global connectivity. 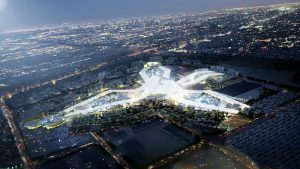 The 15,000 square meter UAE pavilion in Dubai Expo 2020 encompasses exhibition areas, auditorium, food and beverage outlets, and VIP lounges spanning across 4 floors. After the UAE, Saudi Arabia’s pavilion is the second largest. The 13,069 square metre space aims to promote tourists and businesses to come to Saudi Arabia. With a facade that opens like a large window into the future, soaring into the sky, the unique design by Boris Micka reflects a society deeply rooted in its culture with unlimited ambition. You can also get a taste of the kingdom’s history and culture through an immersive experience the size of two football fields. Also called ‘The Poem Pavilion’, UK’s pavilion is in the shape of a conch shell. 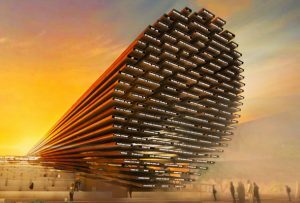 It has a 20-metre high glowing LED façade that beams out an AI-generated global message, which Expo 2020 attendees will be able to contribute to. Designed by British artist and designer, Es Devlin OBE, it aims to highlight the UK’s expertise in artificial intelligence and space. 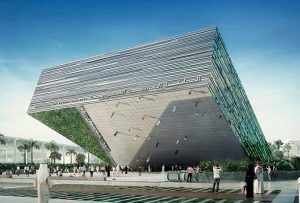 A lot is expected from United States of America’s pavilion at World Expo 2020 in Dubai. The winning design by Fentress is based on the theme “What Moves You,” and it reflects the power and diversity of culture, technological innovation in mobility, and commercial opportunity throughout USA. The Spanish Pavilion has a vibrant look. 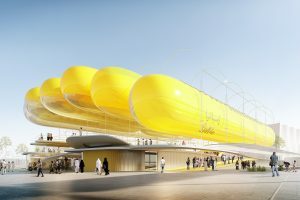 Designed by Selgascano and FRPO, the pavilion includes an inflatable canopy of nine yellow ETFE cylinders set within a steel framework. Structured as a ‘breathing pavilion’, the two inflatables move up and down to respond to views, light and breeze. The pavilion is made to be ultralight as a more sustainable structure that could be easily removed and transported. 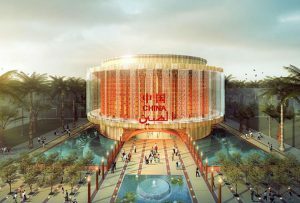 The China Pavilion is modeled on a traditional Chinese lantern themed under ‘building a community with a shared future for mankind – innovation and opportunity’. While the exterior wall transforms into a dazzling digital light display symbolizing hope and a bright future, China showcases its four inventions: paper, the compass, gunpowder and movable-type printing via innovative modern techniques.